Blog »Stand up. Speak up. Ignite Change. Stand up. Speak up. Ignite Change! There are moments in life when standing down is not an option — and this is one of those moments. Everything we cherish, believe in, and work for is on the line. It is now up to us to stand up and defend the lives and rights of the people in our communities who are threatened by oppressive and immoral policies in a new age of hate and division. Join us as we kick off our annual “I Have a Voice” campaign, an invitation to like-minded people like you who are willing to go the extra mile for their community. Our goal is to raise $50,000 to help develop new community leaders, fight for policies that support underrepresented communities, and mobilize our family, friends and neighbors so they are fully engaged in our democracy. Your tax-deductible monthly donation or one-time gift is the spark necessary to Ignite Change in San Diego. Donate now because standing down is not an option! 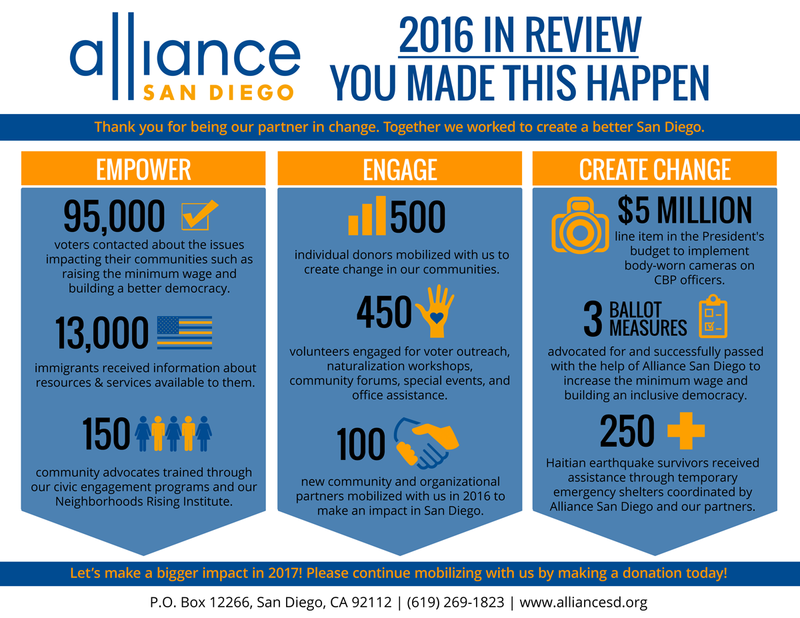 For 10 years, Alliance San Diego has partnered with community members to advocate on behalf of marginalized communities. We have helped shaped policies that benefit all San Diegans, and have worked hard to create a progressive San Diego where all people can achieve their full potential and environment of safety, harmony, equality and justice. Join us as we stand up, speak up and ignite change! Become a monthly contributor today!